The Thyroid Fix: Reduce Fatigue, Lose Weight, and Get Your Life Back by Dr Shawn Soszka is a medical nonfiction book packed with knowledge and one that will appeal to both professionals in medicine and their clients. The book gives readers the tools they need to understand the root causes of thyroid disorders and how to correctly diagnose and treat specific thyroid conditions. The book explores the holistic approach to treating thyroid problems, a discussion of the thyroid and how it works, an understanding of the relationship between the brain and the thyroid hormones and how they are transported, symptoms of low thyroid, the connection between weight loss, fatigue and thyroid related problems, and a lot more. With very little medical knowledge, I was able to understand the message of this book and that is one of the achievements of the work. The author has succeeded in translating complex ideas into a language that the ordinary reader can easily understand. I have often heard, perhaps in passing, about the thyroid, but this book offered everything I needed to know to understand what it really is and the role it plays in our health. The author’s professional experience is beautifully written into this book and I enjoyed the insightful writing. The Thyroid Fix: Reduce Fatigue, Lose Weight, and Get Your Life Back gives readers the tools they need to treat health conditions related to thyroid. While the writing is great, it is the information it conveys that had me turning from one page to the next. Here is one of the few books that will, undoubtedly, add value to readers' lives. The Thyroid Fix by Dr Shawn Soszka is a comprehensive non-fiction medical book that is written to address all thyroid related disorders. The book is very detailed and the book outline and table of contents itself clarify what to expect. There is a brief introduction to the thyroid function itself at the beginning of the book and how it works in the body. Then, the book dives into various chapters relating to what the thyroid does, the symptoms to typically watch for in thyroid dysfunction or dysregulation, hormone imbalance and its implications in overall health, Hashimoto’s Thyroiditis, what it is, how to diagnose it, laboratory testing for thyroid irregularities, how to determine if and what medicine works best for you, an ideal thyroid diet including information on various types of diets, best supplements for thyroid disorders with detailed information and resources about different options, maintaining overall health with exercise, sleep, and lifestyle changes, and more. There is also a bibliography and a reading list provided at the end of the book. 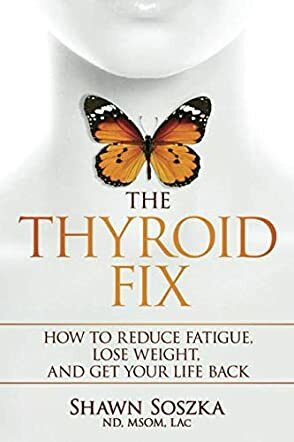 The Thyroid Fix: Reduce Fatigue, Lose Weight, and Get Your Life Back is an excellent book and takes a holistic and comprehensive approach to the topic. Dr. Soszka writes with authority and experience in the field and it is obvious that his techniques and tips come from a tried and tested place. His writing style is engaging and straightforward and although this is a medical topic, the content is written for a layperson and avoids heavy medical jargon and if medical terminology is used, it is sufficiently explained for the average reader. I think this book would be useful to anyone presenting with any thyroid-related symptoms or even for someone who does not have any thyroid conditions but wants to learn more about the subject. Overall, this is a relevant book. Do you have any of the 300 different symptoms of an under-active thyroid? Whether it first affects your skin, your mood, your digestive system, your cognition or causes you to feel fatigued, there are many ways that hypothyroidism can be and is misdiagnosed, because the symptoms can also be caused by a number of other conditions. The important thing is to start with a proper diagnosis, and then implement a healthy plan to improve the performance and capabilities of the thyroid. This small little gland is extremely important in your body and no matter what it’s causing for you, the symptoms will continue to get worse and also continue to get more serious. That’s why The Thyroid Fix: Reduce Fatigue, Lose Weight, and Get Your Life Back by Dr. Shawn Soszka is so important. The Thyroid Fix by Dr. Shawn Soszka is all about what you could be doing to help improve the function of your thyroid, especially if you’ve been diagnosed with a thyroid condition. What’s really special about this book, however, is that it doesn’t just tell you what to do. It actually walks you through what your hypothyroidism really is, what it can do to your body, and what some of the common causes are, so you can better understand the disease. Then it gets into the ways that you can seek out help to deal with the condition, even including some of the lesser known options or ‘off-label’ ways that doctors are seeking to treat it. The more you know, the better your chances of seeing a lessening of your symptoms and a definite slowing of progression. The Thyroid Fix: How to Reduce Fatigue, Lose Weight, And Get Your Life Back by Dr. Shawn Soszka is an insightful and helpful book to convince patients to think about their thyroid condition holistically, and it educates them on lifestyle changes which are essential for identifying and treating the root cause. Much can be done to improve hypothyroid conditions and overall health. This book will definitely help all those who have been diagnosed with hypothyroidism and experience symptoms associated with low thyroid function, such as fatigue, brain fog, hair loss, hormone imbalances, and difficulty losing weight. The guidelines shared apply to both men and women, and the holistic approach will help patients to reduce the symptoms, make them feel better, and enable them to move closer to optimal health. This book is informative and the inclusion of free videos, cheat sheets, and guides is useful when it comes to understanding better thyroid health. The author handles the topic methodically and extensively, making it easy for thyroid patients and readers in general to understand the thyroid, thyroid related problems, and common symptoms. The book also gives health choices so that readers can decide on what works best for them while choosing the food they want to consume and making a diet plan accordingly. There are many people with thyroid problems. This is a good book that will help readers take charge of their lives, and help them address their thyroid problems holistically. The Thyroid Fix: Reduce Fatigue, Lose Weight, and Get Your Life Back by Dr. Shawn Soszka talks about your thyroid and how to fix it. The book goes into great detail about what happens to your thyroid and talks about the underlying cause. Dr. Shawn Soszka also talks about different ways to treat the thyroid. Dr. Shawn Soszka also gives symptoms of thyroid disease as well as other diseases, so you can compare. The book talks about the medications you can use, but also a holistic approach as well, such as diet and using herbs and vitamins. Dr. Shawn Soszka gives many other suggestions as to what the health issues are besides your thyroid, such as fibromyalgia. The author uses chapter highlights at the end and gives suggestions on other books to read if you need even more details. I think that The Thyroid Fix: Reduce Fatigue, Lose Weight, and Get Your Life Back is a must-read if you are like me who has been dealing with a thyroid issue all my life. Dr. Shawn Soszka goes into great detail about what makes the thyroid work and not work and writes so that it makes sense, since not all of us can understand technical terms. I also like how the author gave us examples of other diseases like fibromyalgia so we can compare the symptoms, since some of them are similar. Dr. Shawn Soszka also gives us a chapter highlight, which I found to be quite useful. I also loved the other options about managing the thyroid, though I have to admit the diet one sounded more painful than the thyroid issue. But seriously, if you have health issues, especially with your thyroid, then I would highly recommend reading this book. It literally could be a life saver.